Pablo - Executive Landscaping, Inc. Sometimes things come to you in phases. “Let’s get the backyard done,” you think. But once that is done, the next thought is, “The front yard can’t compete!” We can help it all flow and work together. While Executive Landscaping, Inc., was originally hired by the Pablo family to provide residential design landscaping services and a solution to the issue of erosion in the backyard, the client thought it made sense to address additional issues in the front yard as well. With a garage five feet from the front door, creating artistic flow was no easy feat. Our job is to think outside the box. Garage door in the way? No problem! Sit back and watch! The property had outdated and poorly maintained front yard landscape design, resulting in a lack of curb appeal. Overgrown bushes near the front door obstructed it from view and gave the impression of overcrowding due to the proximity of the front door and the front-facing garage. 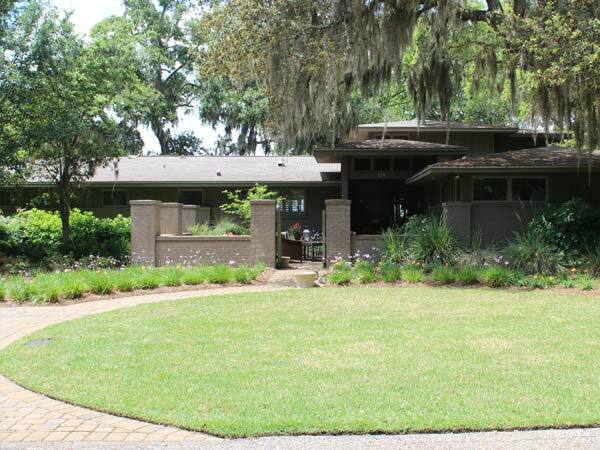 Of greatest concern in the original front yard landscape design was the fact that any visitors to the home would see nothing but the garage door. Additionally, in the event that anyone parked in front of the garage, maneuverability became an impossibility. When you look at the photos, you will see just how important our improvements were. Moving a garage door isn’t the first thing that comes to mind, but look at the results! 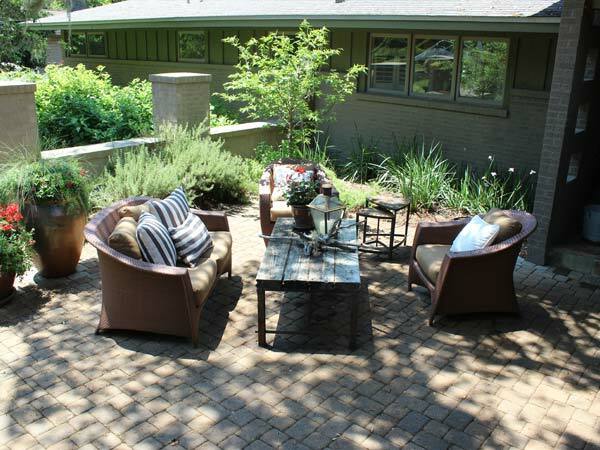 The new front yard landscape design first addressed the need to remove all plant material and foliage that was overgrown and in competition with the view of the front door. To effectively shift the focal point from the large garage door to the front door, it was necessary to move the garage door to the backside of the garage and completely re-configure the driveway. 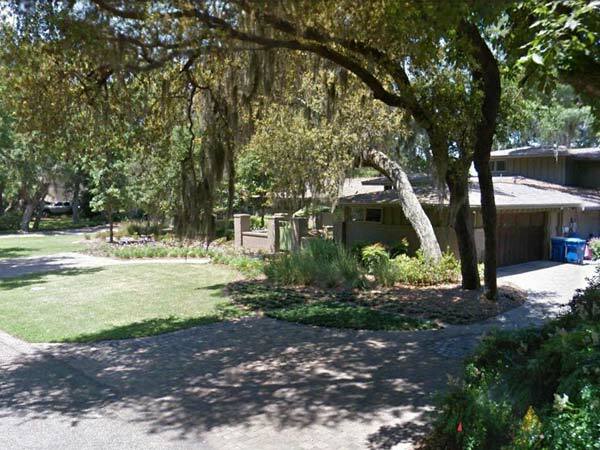 It was also vital to the execution of the front yard landscape design to remove a large live oak that blocked direct access to the garage entrance. 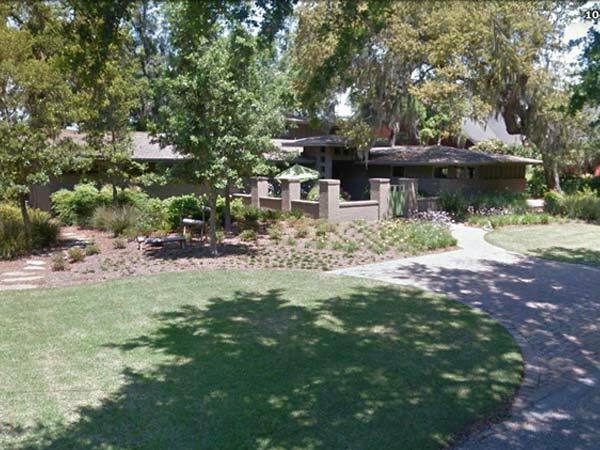 Due to the home’s location in a community known for its large live oaks and Spanish moss, the client agreed with our recommendation to remove only one tree while saving the majority of the live oaks by the garage and planting additional live oaks to left side of the property to establish new canopy trees. While the plan of our design services resolved one issue of great concern by relocating the garage door, the new placement created a blank wall adjacent to the front door and provided no direct access to the front door from the new garage driveway. To alleviate the problem and direct visitors to the front door while shifting their focus away from the garage drive, we installed a two-car parking pad with a sidewalk approach to a courtyard, which created a new focal point and utilized space that would have otherwise been wasted. When the project was complete, the Pablos were given a newly updated front yard that provided visual appeal from the street and allowed fully defined, useable access to both the garage and front doors. We created a new courtyard to add to the curb appeal, trimmed back the overgrown landscaping, and planted new oak trees to tie into the existing growth. By making structural changes to their garage and creating a new point of entry, we eased the issue of access and parking; and new walkways offered a clear path to the front door. Your front yard landscape should scream with curb appeal! Call the experts at Executive Landscaping, Inc., for your estimate today!